Ankle Sprains are perhaps the most common injury to the ankle joint and supporting ligaments, and if not treated properly can cause chronic ankle pain. The most common sprain is the inversion ankle sprain, in which the ankle rolls over on the outside. An ankle sprain is the stretching and tearing of ligaments - in the sprained ankle the most common damage is done to the talo-fibula ligament (if the ankle sprain is worse, the calcaneo-fibula ligament can also be damaged) - sometimes the tendons also get damaged. Anything that makes the ankle 'tip over' increases the chance of an ankle sprain - this can occur in sport (eg jumping and landing on someone's else's foot), walking on uneven surface, twisting motions etc. What is the most effective ankle sprain treatment? What exercises & stretches do you recommend for ankle sprains? 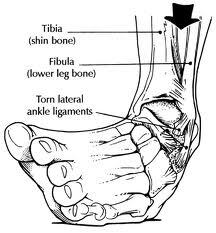 What symptoms are most commonly associated with ankle sprains? What what shoes are best for ankle sprains? Where can I get a splint for a sprained ankle? Why is my ankle sprain pain so acute?